Your time is under attack. You just can’t get enough done. You find yourself wondering where the hours go. You’ve tried every time-management system you can get your hands on—and they’ve only succeeded in making your work more complicated. How to identify your own productivity style as well as the styles of those around you—bosses, coworkers, staff, and family. How to select your “tools of the trade” to maximize your effectiveness, from the style of pen you use to the way you decorate your office. When face-to-face conversations are more effective than e-mails—and vice versa. What it takes to lead the perfect meeting. Why a messy desk is right for some, but a disaster for others—and how to tell. 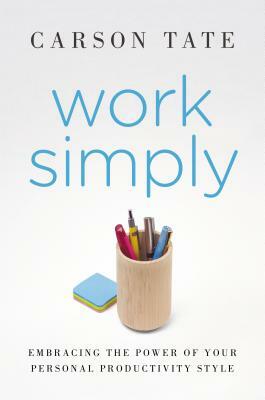 CARSON TATE, the founder of Working Simply, is a nationally renowned expert on workplace productivity. She serves as a consultant, coach, public speaker, and executive trainer for a wide range of Fortune 500 companies and other clients. She lives in Charlotte, North Carolina, with her family.